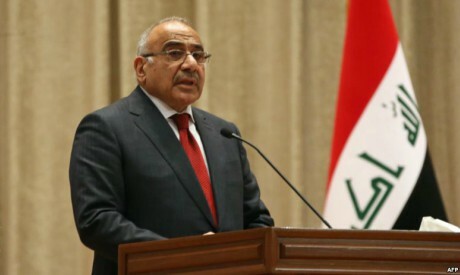 Iraq will prioritise its own interests and independence when it comes to helping the United States enforce sanctions against Iran, new Prime Minister Adel Abdul Mahdi said on Thursday. President Donald Trump's decision to withdraw the United States from a 2015 international nuclear accord with Tehran in May and reimpose sanctions has put Abdul Mahdi's incoming government in a difficult position, since Iraq's economy is closely intertwined with neighbouring Iran's. "We want to secure Iraq from any interference in issues, affairs of other countries, whether it's a neighbouring country or it's any other country in the world," Abdul Mahdi told a news conference in Baghdad. The United States and Iran, increasingly at odds, are Iraq's two biggest allies, and Washington has said there will be consequences for countries that do not respect the sanctions. Abdul Mahdi's statement on Thursday did not deviate much from the stance of his predecessor, Haider al-Abadi. In August Abadi said Iraq was against the sanctions "as a matter of principle", but that the country would follow them. "We consider them a strategic mistake and incorrect but we will abide by them to protect the interests of our people. We will not interact with them or support them but we will abide by them," he said. Abadi's government later asked Washington for permission to ignore some sanctions on its neighbour. Abdul Mahdi did not say on Thursday whether his government would continue to seek the exemptions. The next wave of sanctions are due to come into effect on Nov 4. US Secretary of State Mike Pompeo called Abdul Mahdi on Thursday to congratulate him on his swearing in. They also discussed the enhancement of bilateral relations, according to a statement from the Prime Minister's media office. Abdul Mahdi was speaking at his first news conference since being sworn in just past midnight on Thursday. He also announced that he would be moving the prime minister's office and cabinet outside Baghdad's heavily fortified Green Zone. "All of Iraq should be a green zone. Security and beauty should be everywhere in Iraq. Officials must share everything with citizens, the good and the bad. We should share everything with our people."